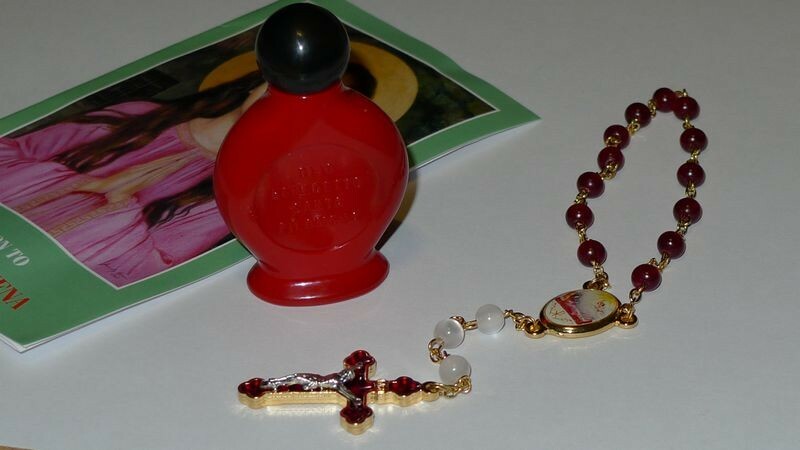 Blessed Holy Oil and Chaplet with prayer card. Prayer included are the chaplet, litany, novena prayer along with information on the various devotions to St. Philomena. Initially this devotion happened very simply . On the octave (which is 8 days after the arrival of the sacred body on the 10th August) of the translation of the Reliquary of Saint Philomena to Mugnano, a woman from Avella, full of faith in God, dipped a finger into the oil of the lamp which burned in front of the altar of the Saint, and anointed the eyelids of her blind child with it. The child immediately received sight, to the astonishment of all present. The Solemn celebration of the annual Patronage and blessing of the exclusive sacramental oil of St. Philomena is held every year on the first Sunday after the 10th January at the Sanctuary of Saint Philomena, Mugnano del Cardinale, Avellino, ITALY. • The Creed on the Crucifix or medal of Saint Philomena to ask for the gift of Faith. • Thirteen Hail Oh Holy Saint.... or 13 Hail Marys, each followed by “Saint Philomena, pray for us”, (red beads) to signify the 13 years our Martyr lived on earth. Hail, oh holy Saint Philomena, my dear patroness. As my advocate with thy Divine Spouse, intercede for me now and at the hour of my death. Saint Philomena, beloved daughter of Jesus and Mary, pray for us who have recourse to Thee.